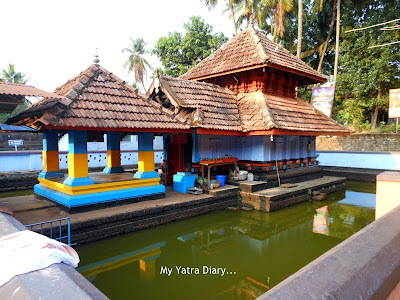 Around 20 km from the town of Kannur in Kerala, 5 kms south of Taliparambu town and a short drive of around 15 minutes from Shree Muthappan Temple, is situated the Trichambaram temple. Descend a fleet of stairs and you are led to the temple compound in the center of which stands the main temple. 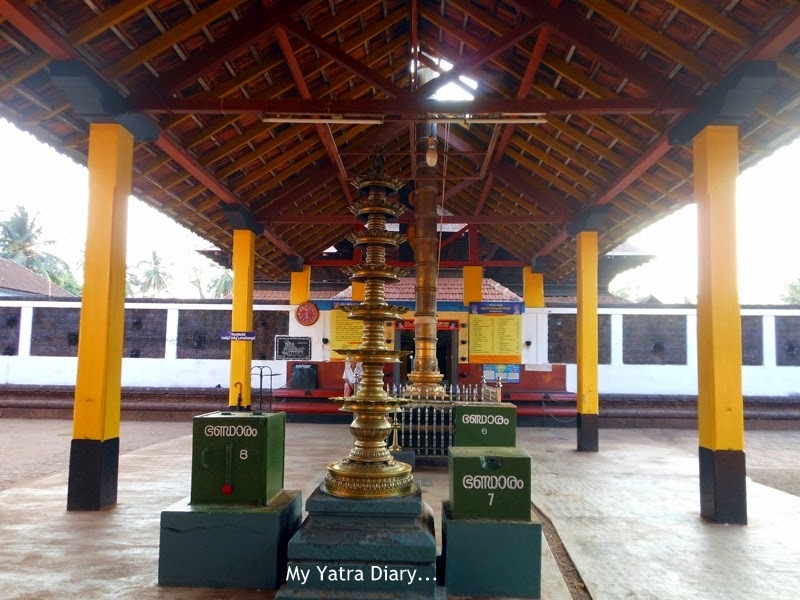 Dedicated to Lord Shree Krishna in his child avatar, the Trichambaram temple, like majority of temples in Kerala, exudes a high degree of calm and serenity the moment you enter its blissful shade. Long strings of Tulsi malas and scores of non lit deepams line the way to the sanctum sanctorum. The sanctum is bright intensely lit up with a multitude of deepams all around and the Lord seated comfortably in the center. A huge bell hangs at the outside but the priest discourages me to ring it the moment he sees me lifting my hand towards it. I am a bit surprised but soon reason it for myself: Peace here is left to be just that... peace – untouched and undisturbed. The aura of the flickering lights emanating from inside the sanctum works magic with the peace spread all around. And one has to take it in before moving forward to the circumambulation path which reveals the antiquity of the temple in all its glory. The outsides of the sanctum walls flourish in ancient paintings depicting various leelas of Lord Shri Krishna and dating back to the 15th century, a compelling reassurance of the rich historical value of the temple. Outside, in the shadows of the main temple stands another shrine encircled by a small pond and dedicated to Goddess Durga. 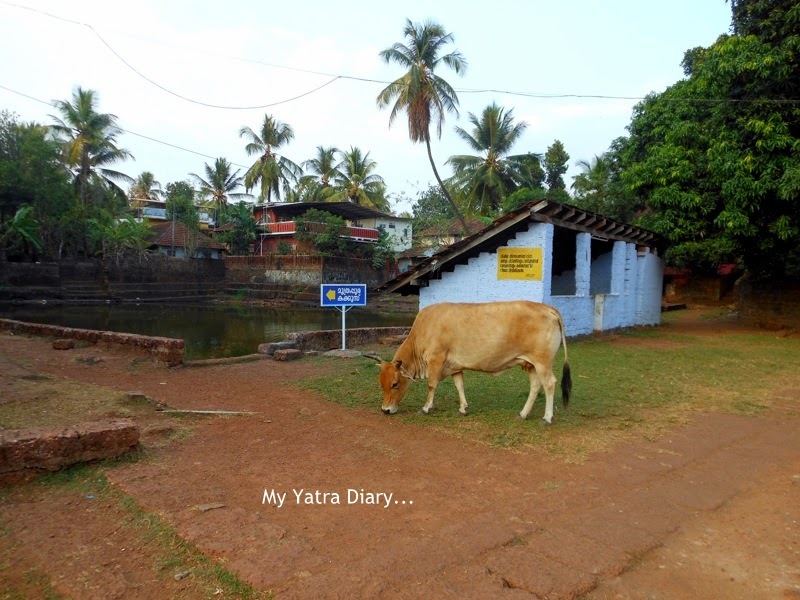 Besides this shrine is a second pond, a great place to spend a few minutes in contemplation along with a grazing cow before finally making my way out of the temple. Festival: The annual festival of the temple is the Trichambaram Mahotsavam, a vivid occasion usually held in the months February/March. A long while since I've been on my virtual travels with you, as always its been a delight. A serene and holy place; I can tell from just the pictures. The little mini shrines are so cute, and I can see the coy in the pond. The yellow columns are very pretty, yellow being a spiritual color. Lovely pictures from Kerala. I have always enjoyed the natural beauty of the place but seldom been to temples. The practice of forcing people to wear a particular dress is something that drives me away from most Kerala temples. Peace- just that and itself. I could almost hear the joyful silence. 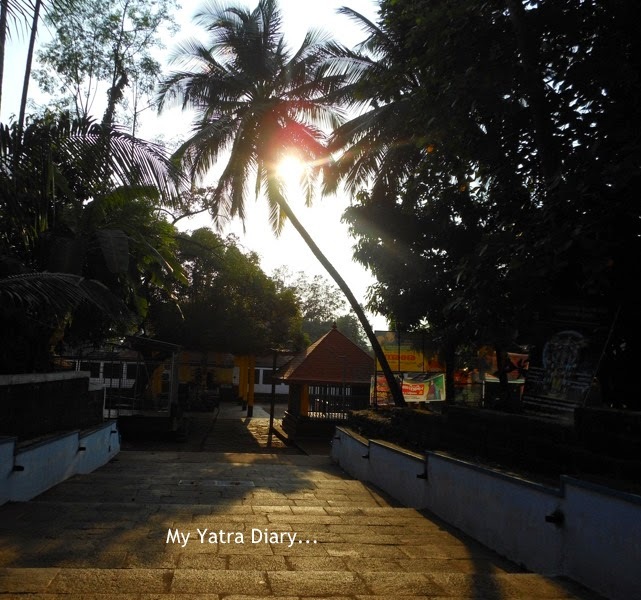 calm and serenity is an essential characteristic of all Kerala temples as you have rightly said. They provide an opportunity to establish oneness with the presiding deity. This is what appeals me. Parasannikadavu could have been noisy. I agree. The peace helps us get closer to the supreme and this factor is something that pulls me to visit the state again sometime in the near future. Yes, Parasannikadavu was a little more crowded than this one perhaps because it is more famous with the locals and it also boasts of theyyam performance two times in the day. Arti, Another awesome post from your yatra. Great to read, Thanks for sharing. Beautiful photographs and description. Looks like a very serene and calm atmosphere. Thanks for introducing this little known temple. Its been years since I visited this temple. and this post brought back loads of memories! Trichambaram temple looks so peaceful, even the water in the pond is so calm and reflective. I havent been to the temple. Infact havent been to Kannur also. I am from the other part of Kerala, Arti (from Quilon), around 2 hrs from Trivandrum.. But I can tell you the temples in Kerala are very beautiful and well maintained.. Absolutely quiet and calm temple complex! Beautiful photos and I like the tank areas. Such a serene place. Wish photography is allowed inside. I think this temple seems to be different from Japanese, bright color, but so calm and peace. Wonderful temple and nice pictures . I'm guessing that all the greenery and visits to these temples totally recharged you. Don't temples in Kerala have a smell of their own :)? Aarti... this was exactly what I needed to pep me up on a bad day - memories from my childhood!! 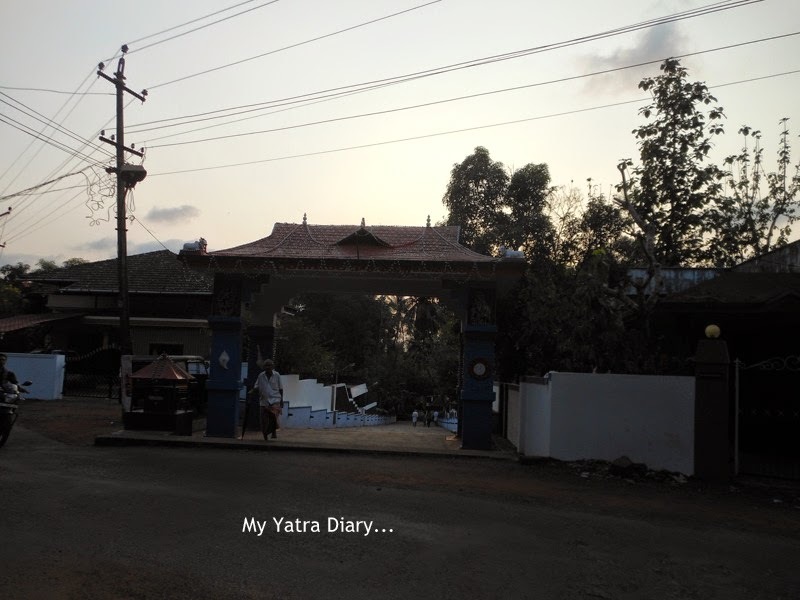 I grew up a few kilometers from this very temple. 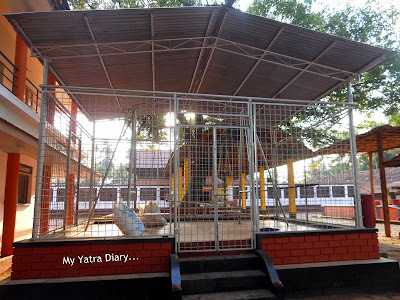 Also do visit the Perlassery Subramanya temple .... would love to see a post on that as well. Thank you!! Serene.. Feel like visiting..Kerala is long pending in my agenda.. This temple has more muted colors than all the other colorful temples on your blog which are much more colorful than Japanese temples of unpainted wooden structure. Is dress code to enter the temple only for men? Thank you for the lovely and kind comment. After long days of dry rainy season, it rained yesterday at last and occasional rain is forecasted on Wednesday and Thursday. It has been too hot for June and I wish rain softens the heat. Be safe from torrential rain, Arti. The color difference that you see is because of the difference in the regions. This temple belongs to the southern part of India while most of the other temples on my blog (from earlier series) are from northern India. Hence, they are different, in look and even in architecture. The dress code is only for Men in this temple, however many temples in Kerala do follow a strict dress rule for both men and women. Thank you, Yoko for your kind visit and comment. I hope Nara has sufficient rains this season, the weather in my part has been quite harsh for the past few days. I didn't know about the color difference. Could you explain a little more? You go to Kerala temple to pray to Lord. You enter the temple with reverence.Your mind, body and clothes should be clean when you go to temple. Each region has its own customs, practices and traditions. We have to respect it. So when you go to kerala temple men wear Veshti ( mundu) and women wear "settu mundu" .This was the practice for centuries. Now a days women also wear sarees and salwar kameez or churidar too. Ringing the bell is the exclusive preserve of the chief priest at appropriate times. 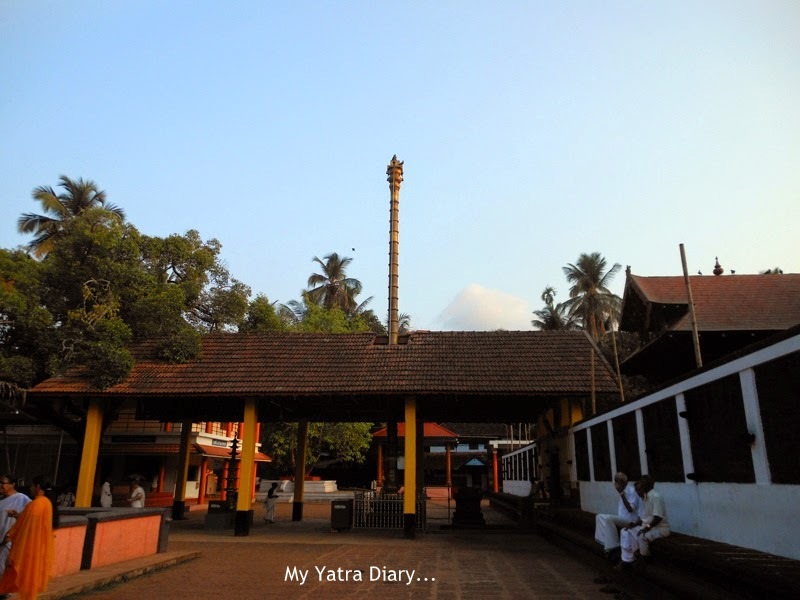 You will find that the priests in Kerala temples are very devoted and disciplined. Their day starts at 4.00A.M. ( brahma muhurtham) and they take their first food only after Ucha pooja( that is Pooja for the Lord before noon) which in most temples are around 11.30A.M. Going to temple should not be considered as sight seeing trip or excursion. Please try to preserve the serenity and sanctity of kerala temples. To the Jawans in Uttarakhand: WE Salute! A Sunrise and a 5 Year Wish!